Piano wood plaque with a 6 1/2" gold plated shovel and a 6" x 1" blank plate. Piano wood plaque with a 6 1/2" gold plated shovel and a 6"x 1" blank plate. MATERIALS : Piano wood, gold plated zinc cast shovel. 6" x 4" walnut finish wood plaque with a 5 1/2" bright gold shovel and a 4" x 1" printed or lasered plate. 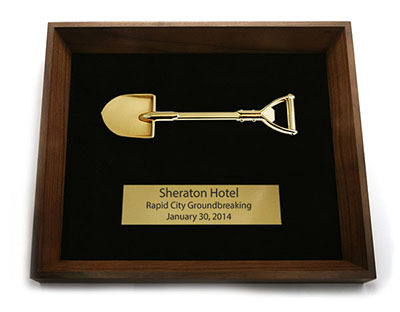 MATERIALS : Walnut plaque, gold plated metal shovel. 6" x 8" wood plaque with a 5 1/2" gold plated shovel. MATERIALS : Wood, gold plated zinc cast shovel. Lg Walnut Plaque w/Shovel 6 in. x 8 in. Perfect for either a groundbreaking or a grand opening, this walnut plaque features a 6 1/2 in. gold plated shovel and a 6 in. x 1 in. blank plate. Size 6 in. x 8 in. Screen Printing: On Plates: $10.00 each. Set-up Charge: $75.00 per color. Straight Line Copy: $40.00. Logo: $80.00. Engraving: On Plates Only: $14.00 ea plate includes up to 16 letters. Additional letters $0.35 each. Laser Engraving: (on Black Plates / engraved copy shows in gold): Set-up Charge: Straight Line Copy: $25.00. Logo: $56.00. Each Plate Engraved: $20.00. ANY ITEMS, PRINTED OR BLANK ORDERED IN QUANTITIES LESS THAN MINIMUM, WILL HAVE A $30.00 HANDLING FEE. 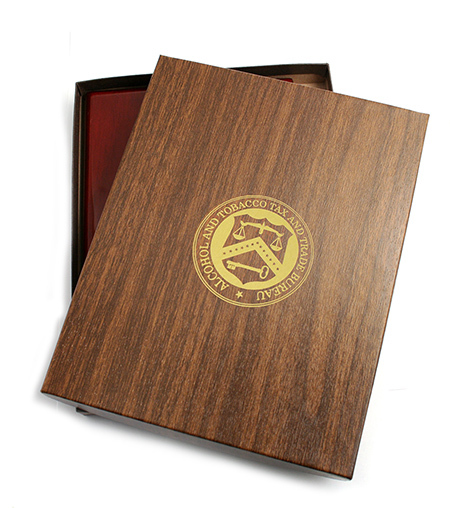 An elegant Rosewood-finished Presentation Box with gold shovel, nestled in a custom-cut foam insert. 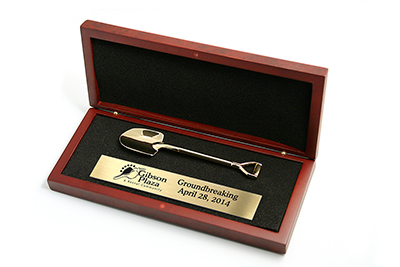 Personalization is available on a laser-engraved or printed plate inside or on top of the box. SIZE : Box: 8-3/4" x 3-3/4" x 1-1/4"
MATERIALS : Rosewood finished box, gold shovel. 9" x 12" x 1-1/2" walnut shadow box with black velvet background. 7" gold shovel and personalized plate. SIZE : 9" x 12" x 1-1/2"
PRODUCTION TIME : 10 working days. 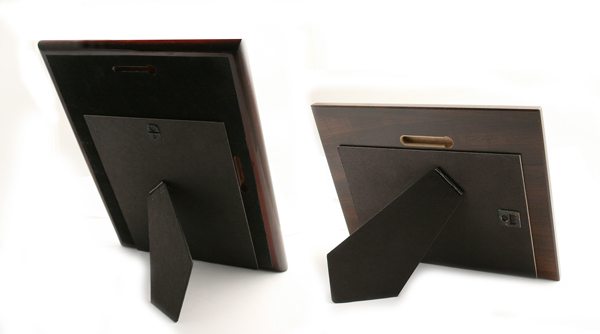 COPYAREA : 6" x 1" or 6" x 1-1/2"
Black cardboard easels to fit our plaques. Available in three sizes. SIZE : 8" x 10" or 9" x 12". PRODUCTION TIME : 6-8 days. COPYAREA : Up to 3". PRINTED GOLD PLATE : $15.00 each. For an additional color add $3.00 ea. SET-UP (STRAIGHT-LINE COPY) : $50.00. RUNNING CHARGE : $20.00 ea. Packaging: Gift box; Units/Ctn: 1; Weight/Ctn: 3.75 lbs. FITS a 4 x 6 insert Back is 6-1/4" x 8-1/4"
GENERAL INFORMATION: WE CAN RUSH THESE!! 1/8� clear acrylic over a 1/4� acrylic back, hanger included. Parts shipped unassembled in gift box. Add $7.00 to mount an insert or assemble. Screen set-up charge 75.00 per color. PMS color match 40.00. Reorder set-up charge 40.00 per color. Setup: $15.00. Additional charges for setup and shipping may apply. Packaging: Bulk; Units/Ctn: 16; Weight/Ctn: 38 lbs.